We’re all looking for those new and different appetizers and entrees that aren’t the same old same old recycled everyday of the week BORING ones we default to. To combat the unexciting with the interesting I suggest you look to the eggplant. 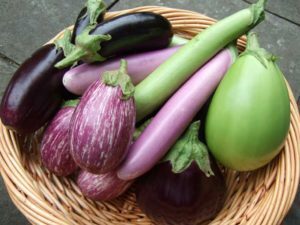 Eggplants are available throughout the year and can actually add a sophisticated flavor to ho hum dish. Its exotic taste and texture lend itself to being prepared in a variety of different ways. Eggplant is wonderful in salads, soups, main courses, casseroles and side dishes and can be roasted, sautéed, grilled or baked. 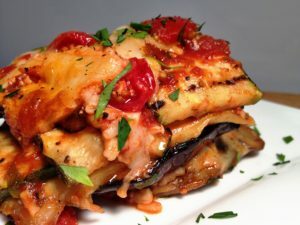 Eggplant is primarily composed of water so choosing just the right cooking method for each recipe dose come into play most of the time. Because there is so much water in the eggplant you should be prepared for there to be quite a bit of shrinkage when it cooks. Eggplants are part of the nightshade family of vegetables and should be firm to the touch and be free of bruises and soft spots. They have a slightly bitter taste and the before it’s cooked the texture is kind of like a sponge. Eggplants are very flavor friendly and tend to absorb the flavor of whatever they are cooked with. Another interesting cooking note about the eggplant is that will probably need a little more oil than you think you will need when you cook them because they tend to absorb it. Don’t use too much but they do tend to stick and burn to a cooking surface if there isn’t enough liquid or oil. A medium size eggplant usually weighs about one pound and you can get about 4 cups chopped eggplant from it which in turn yields about 1 3/4 cups cooked eggplant puree. In large sauce pan saute the onions, garlic, pepper and mushrooms in the olive oil until the vegetables are soft. Add the eggplant, tomato sauce, tomatoes, oregano, basil pepper and red pepper. Cover and cook over medium heat for 15 minutes. Uncover and cook 25 minutes more. In another bowl combine the cottage cheese, mozzarella, and parsley. Rinse the noodles under cold water and let sit on paper towels for 5 minutes. Preheat oven to 350 degrees.